If spirits are actually the personalities of those who once lived and refused to cross over to the other side at the moment of death.... then wouldn't these spirits reflect the turmoil of that former life? And if hauntings are the residual effects of trauma being imprinted on the atmosphere of a location, then wouldn't places where terror and insanity were commonplace be especially prone to these hauntings? The Main Entrance to the Bowen Building at the Hospital, around 1903. Hospital staff Members in 1903. In 1902, the hospital would reopen with Dr. George A. Zeller, a pioneer in mental health, at the helm. The new hospital implemented the "cottage system" and 33 different buildings were used to house patients. There was also a nurse's home, a store, a power house, and a domestic building with a laundry, bakery and kitchen. Zeller also implemented a system with no window bars or restraints, something that was unheard of in those days. Dr. Zeller also realized that a system was needed for the burial of the dead at the hospital. He decided that the asylum would take care of the burials of the unclaimed, but that all other deceased persons would be shipped home to their relatives. The hospital's burial ground eventually grew to include four cemeteries, which were located behind the main buildings. The older cemeteries are marked with stones that only bear numbers, as many of the patients came there without names. The newer cemeteries have stones bearing names, birth and death dates, and patient numbers upon them. The oldest cemetery here would mark the location of the very first ghost story to be associated with the hospital. But this is no mere folk legend or rumor, this was a documented account of a supernatural event.... and the teller of the tale was none other than Dr. George Zeller himself! Shortly after taking over the hopsital, Dr. Zeller created a burial corps to deal with the disposal of those who passed away while in care of the hospital. The corps consisted of a staff member of the hospital and a half-dozen of the patients. While these men were still disturbed, all of them were competent enough to take part in the digging of the graves. Dr. Zeller in his Office. Nurses and Patients on the Hospital Grounds. Of all of the gravediggers, the most unusual man, according to Dr. Zeller, was a fellow called A. Bookbinder. The man was completely mute so no one knew his real name. Apparently, the man had suffered a breakdown while working in a printing house, possibly in Chicago, and his mental illness had left him incapable of coherent speech. The officer who had taken him into custody merely wrote in his report that the man had been employed as "a bookbinder". A court clerk listed this as the man's name and he was sent to the hospital as A. Bookbinder. Time passed and eventually Old Book too passed away. Word spread among the employees and as Book was well-liked, and noted for his peculiarities, everyone decided they would attend his funeral. Dr. Zeller wrote that more than 100 uniformed nurses attended, along with the male staff members and several hundred of the patients. Dr. Zeller officiated the service. Old Book's casket was placed on two cross beams above his empty grave and four men stood by to lower it into the ground at the end of the service. Dr. Zeller wrote, "Just as the choir finished the last lines of �Rock of Ages', the men grasped the ropes, stooped forward, and with a powerful, muscular effort, prepared to lift the coffin, in order to permit the removal of the crossbeams and allow it to gently descend into the grave. "At a given signal, they heaved away the ropes and the next instant, all four lay on their backs. For the coffin, instead of offering resistance, bounded into the air like an eggshell, as if it were empty!" A few days later, the Graveyard Elm mysteriously began to wither and die. In spite of efforts to save it, the tree declined over the next year until it was completely dead. Later, after the dead limbs had dropped, workmen tried to remove the rest of the tree, but stopped working after the first cut of the ax caused the tree to emanate an "agonized, despairing cry of pain". After that, Dr. Zeller suggested the tree be burned, however as soon as the flames started around the tree's base, the workers quickly put them out. They later told Zeller that they heard a sobbing and crying sound coming from it. "Today, Old Book's grave remains without headstone or monument," Dr. Zeller wrote about his shared experience. "But if anyone asks where he is, those of us in the know point with a shudder to the remains of the Graveyard Elm." After the death of Dr. Zeller, the hospital remained in continuous use for many more years, adding buildings, patients and care facilities for children and tuberculosis patients. The institution finally closed down in 1972 and remained mostly empty for a number of years. In 1980, it was sold off at auction to anyone who would tear down the empty buildings but it soon became the property of the bank again when the buyer declared bankruptcy. The remaining hospital buildings are today the property of Winsley Durand Jr., who hopes to convert the place into office space. It is private property and trespassers are not allowed. Even though trespassing is discouraged at the old hospital, it hasn't stopped vandals and would-be ghost hunters from going inside the place over the last three decades. Although many of these people have been less than kind to the old building, most are not looking to damage the structure... they are looking for ghosts. As with most abandoned structures of this kind, stories about ghosts and hauntings are common. 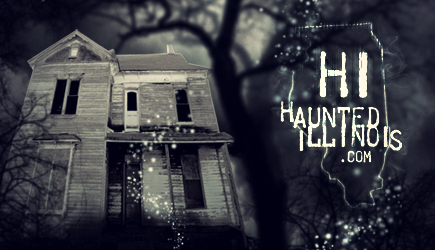 What derelict dwelling has not been targeted as the local "haunted house" at one time or another? With buildings of this type, once a story gets started, its hard to stop..... except in this case, the stories appear to be true! The Dining Hall as it looked in 1903. "The place is full of spirits", Rob has told me on more than one occasion. And I would say that he's right! 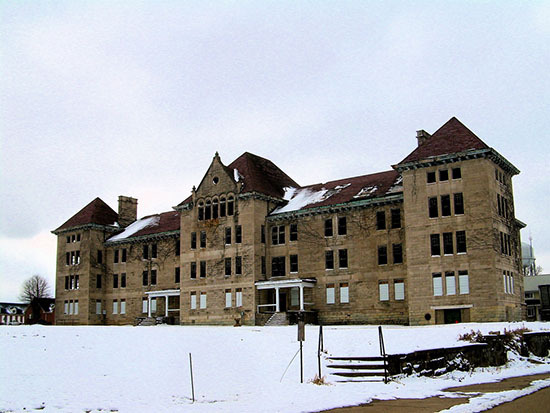 The Bartonville Hospital is located on private property between Peoria and Pekin, Illinois.